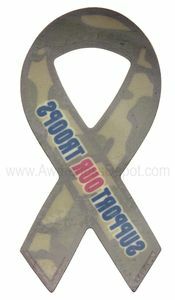 Home > Patriotic > Camouflage Support Our Troops Decals Large 3"x6"
Cameo Support Our Troops .This Camouflage ribbon static decal has the words "Support Our Troops". A perfect way to show your patriotism without ruining your car windows. Clings to the insides of your window using static electricity.